Powdery mildew is a common fungal disease of plants in our area that occurs this time of year. It’s named for the grayish white powder consisting of fungus strands on the leaves of the plant. The fungus uses the host plant for its food supply by sending root-like structures into the leaves and stems. 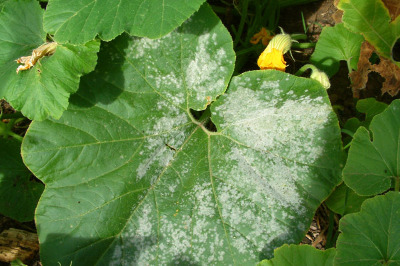 Powdery mildew likes the humid conditions we experience in New England on warm days and cool nights. Some particularly sensitive plants are apples, roses, grapes, peas, potatoes, phlox, squash and zinnias, though there are many more. It’s common for it to start in crowded plantings where air circulation is poor and in damp, shaded areas. 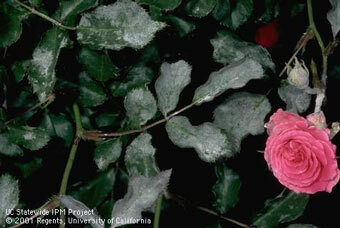 If you’ve had powdery mildew on your plants in previous years, it’s likely to return this year. There are, however, some practices you can institute that can reduce or even prevent future infestations. Additionally, many resistant varieties have been developed. For information and to learn what some of these plants are, click on the website links at the end of this article. You may also want to check for resistant varieties at your favorite garden center. Injury due to powdery mildews is often of minor consequence to healthy plants, although it can become unsightly. If damage occurs, it may include the stunting of leaves, buds, growing tips and fruit. It can cause the death of invaded tissue on some plants, i.e., begonias. Leaves can yellow and cause the death of tissue, which can produce premature leaf drop. When plants are infected, nutrients are removed from them by the fungus. This may cause the loss of vigor in the plant and produce a general decline in growth. The taste of squashes and some other vegetables may also change. Should you wake up to those powdery looking leaves in your garden this year, consider the following cultural practices to reduce the potential of it spreading further and, perhaps, eliminating it next year. As much as possible, when planting flowers or vegetables that you know are prone to powdery mildew, plant in an area with full sunlight and where the soil drains well. When putting in new plants assure you are not crowding them. If you have plants that are already infected, you can increase the air circulation by selectively pruning overcrowded plant material on the plant and between plants. This will help reduce relative humidity and reduce the chance of further infection. Avoid overhead watering to help reduce the relative humidity, or water in the early morning to let the tissue dry as soon as possible. Don’t make late-summer applications of nitrogen fertilizer. This will limit the plant’s production of succulent tissue, which is more vulnerable to infection. Powdery mildew tends to increase in high nitrogen soils so you may want to consider using an organic fertilizer or a slow release fertilizer. When the growing season is over and you are closing your garden for the season, remove and destroy all infected plant parts (leaves, etc.). This will decrease the ability of the fungus to survive the winter. Do not compost the infected plant debris, as the spores (seeds) can overwinter and temperatures often are not hot enough to kill the fungus. Disinfect the tools you use to prune infected plants and all your other garden tools that may have contacted the diseased plant, in a bleach and water solution. If you decide to treat plants infected with powdery mildew, researchers at the University of Rhode Island (URI) have confirmed that a combination of 1 tablespoon baking soda plus 2.5 tablespoons of horticultural oil in 1 gallon of water is effective against powdery mildew on roses. Other New England University Extension web sites suggest this combination for other crops, but URI states this is still experimental. Sulfur products have been used to manage powdery mildew for decades, but it is only effective when applied before disease symptoms appear. If you use this method, use wetable sulfur with a sticker, as it will work best. Read all of the directions on the product. Start applications right before the mildew normally appears. As a precaution, before starting applications to the entire plant, apply the solution to a small test area to assure leaf burn will not occur. If the test is successful, apply the product carefully after each rain until the mildew is under control. Make sure to include the bottom of leaves in your applications. As stated above, consider disease-resistant varieties before you plant, but keep in mind that resistant does not mean immune. Cornell University's Vegetable MD website has numerous listings of disease resistant vegetables that are available. If you know you are already growing plants that are prone to downy mildew, which is different from powdery mildew and occurs under different environmental conditions, but is hard on many types of roses, as well as other plants, follow the mildew forecast webpage recommend by Cornell and developed by North Carolina State University (UNCSU). UNCSU is reportedly working to expand this forecast tool to include other mildews. The forecast and alerts can be followed for the entire U.S. or just MASS. At this site you will also find alerts of when the first signs of downy mildew are first spotted in all of the 50 states. In summary, whether you manage the plants you have to prevent and/or eliminate powdery mildew or choose to plant with resistant varieties, your first line of defense is to follow good cultural practices in your garden and with your lawn.